I have a weird case of the Mondays today. Little bitty things are making me feel all weepy and frustrated. That's why I'm dressed this way. I'm knocking out the crank with a skirt and some purple. My jacket, blouse, and shoes are thrifted. The skirt was sewn by me pre-Violet. Shoulders are in neck! I must be stressed. Greatttt look! I love the purple and leopard. I defunkerize the same way by dressing the total opposite of how I feel. I hope you are having a better afternoon. What a lovely shade of purple you've chosen to wear. The color does compliment you. A nice combination. Love the mix of the prints. I de-funk by writing, getting out of the house or reading a good book. Putting on some dance (or booty music as my mom calls it) and getting down helps too. Sometimes, you just have to be silly to shake yourself out of bad moods. Love the print mixing and the purple sooo chic!!! You look so pretty- I love the bright purple and leopard print. Hope your Tuesday gets better! Thank you. I think the funk has lifted. Ice cream and wine put a nice cap on my evening. V and I went on a nice walk in the sun and balmy temps. It improved my mood a bit. Maybe that was what I needed in my life. love your print mixing, so chic. Love how you worked color into this look. 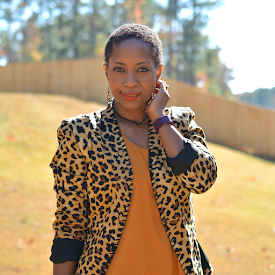 Thanks for showing off your style on Monday Mingle over at Momtrends! Very pretty skirt and you look great in the outfit. The outfit is killer and you are modeling the heck out of it. I hope it cheered you up, the color purple can do that! ooh you look hot lady! Hope it's a better rest of the week! Thanks, Megan. Loe your blog. Following now. Thanks, Chandra! I need more purple too. Its my favorite color. A closet full of purple would be weird though, right? Bright color always jazzes up my mood! Love the purple!